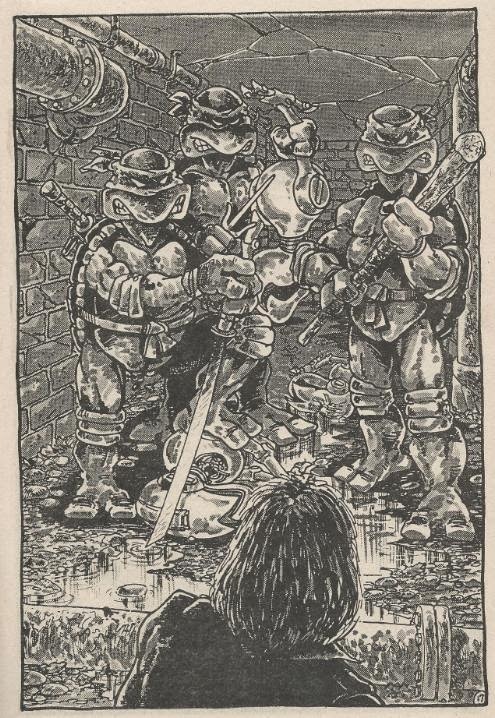 Down in the sewer lair, Raph and Mike are sparring loudly in the living room, much to the annoyance of their brothers and Splinter. Suddenly, something on TV catches Splinter’s attention. It is a news program spotlighting scientist Baxter Stockman and his new “mouser” robots. With the help of his assistant, April O’Neil, Baxter releases a rat into a maze as well as one of the small, toothy mousers. As the mouser hunts down and messily devours the rodent, Baxter explains that the highly adaptive machine is controlled by a “mother computer” rather than any onboard sentience, and can contain up to five rats. Baxter is convinced that the mousers will solve New York’s “rat problem”. As Raph and Mike trash the lair, Splinter decides to go meditate on this predicament. As he leaves, he orders Raph and Mike to clean up their mess. Several weeks pass, and although the mousers prove effective, there has also been a rash of bizarre bank robberies plaguing the city. Inside Baxter’s building, April reads the newspaper article on the subject to Baxter, detailing how the bank vaults were all breached by tunnels only a small child could crawl through. April ponders if maybe the mousers were being used for nefarious purposes, though Baxter shakes the idea off. Baxter then decides it’s high time to show April a little “secret”. As Baxter laughs like a maniac, April decides that now is a perfect time to vamoose. Not wanting her to tell the police, Baxter trips a trapdoor and sends April plummeting into the sewer. As April attempts to navigate the tunnels, Baxter dispatches a trio of mousers to hunt and slay her. The mousers catch up to April fairly quickly and pin her against a dead end. All hope seems lost until April is suddenly rescued…by the Teenage Mutant Ninja Turtles (minus Mikey). The shock causes her to faint. Back at the lair, the Turtles have placed April on a couch and explain the situation to Splinter. April awakens and freaks out, but Splinter calms her nerves, introducing himself and the Turtles. Just as Splinter finishes describing how they came to be and the Turtles’ battle with the Shredder to an enthralled April, something interesting comes on the TV. A shadowy figure threatens to destroy the World Trade Center tomorrow at 3pm unless he is paid twenty million dollars in ransom. To prove his power, he says that he will destroy the Retxab Building at 3pm today. April immediately recognizes the figure as Baxter. 3:03pm arrives and the evacuated Retxab Building still stands…for a few more seconds. Suddenly, the building collapses live on television. Splinter is not pleased and asks April if she can lead the Turtles back to Baxter’s secret lab. She agrees to help and the Turtles head out. At the lab, as Baxter revels over his evil-doing, the Turtles sneak in silently and catch the mad scientist off-guard at the control panel. The Turtles hold the shocked Baxter hostage as April attempts to shut the mother computer down. Baxter manages to loose himself just long enough to trigger the self-destruct program: the mousers will return to the lab and eat everything until there’s nothing left. 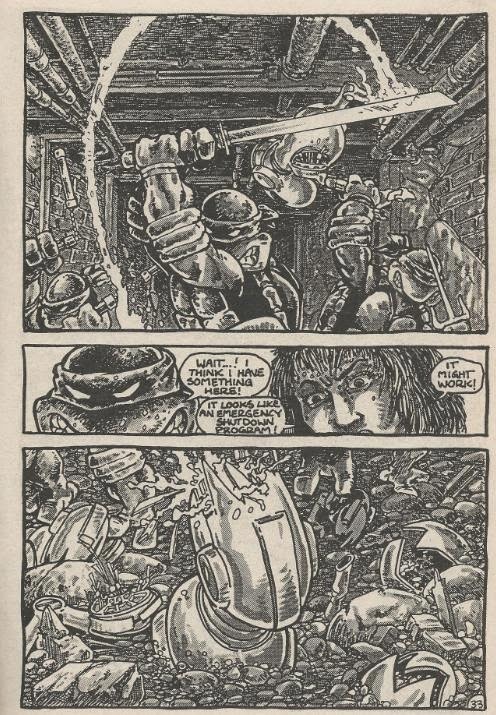 Raph knocks Stockman out and the Turtles and April attempt to escape through the elevator. Unfortunately, the self-destruct program has buried the entire underground complex. 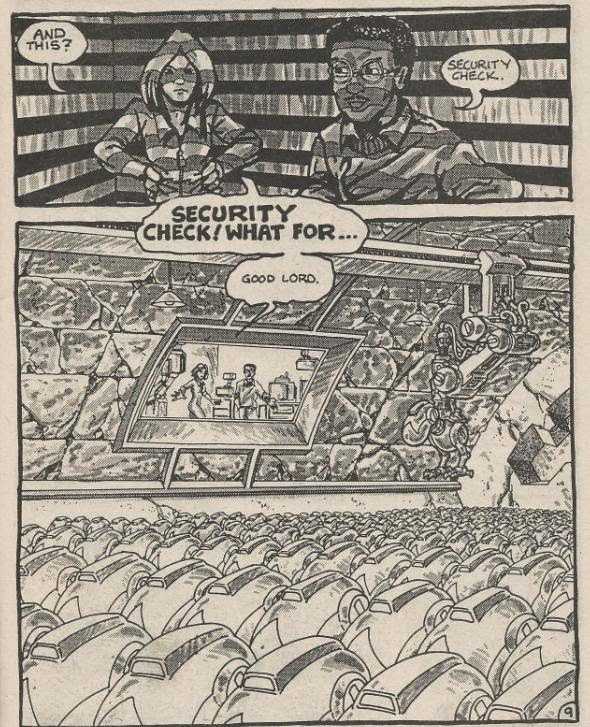 Don asks April to help him try and cancel Baxter’s self-destruct program while Leo, Mike and Raph set some plastic explosives (procured from Baxter’s stock) to blow the tunnels and delay the mousers. As the tunnels collapse, April and Don are having no luck shutting down the mother computer. The mousers eventually breach through the rubble. As Leo, Mike and Raph struggle with the mousers, Don realizes that if they shut down all power to the mother computer, then it can no longer radio orders to the mousers. The Turtles fall back to the lab, but the shut down program is taking too long. Then, just as the mousers breach the walls, all the power cuts off and the robots deactivate. *This story is continued from TMNT (Vol. 1) #1. The story continues in TMNT (Vol. 1) #3. 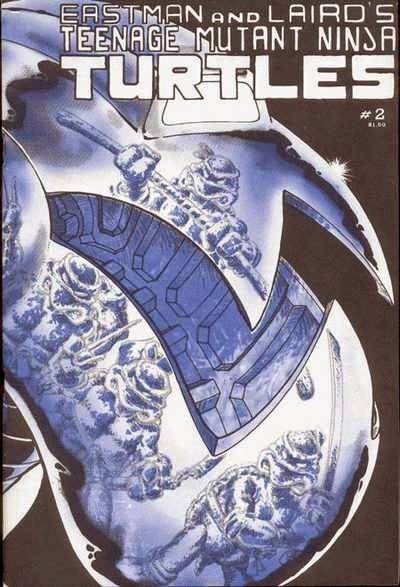 *The third printing of this comic (1986) contained a new, painted cover by Richard Corben, a pin-up page by Mark A. Paniccia, and a five-page bonus story, “The Teenage Mutant Ninja Turtles”, by Fred Hembeck. *A “Cerebus” comic can be seen on page 2. The Turtles will meet that aardvark in TMNT (Vol. 1) #8. *The mousers will return to threaten to the TMNT in Tales of the TMNT (Vol. 2) #61. *Baxter Stockman will return in TMNT (Vol. 2) #2. TMNT #2 isn’t one of the best stories that Eastman and Laird ever wrote, but it’s one of the most adapted. 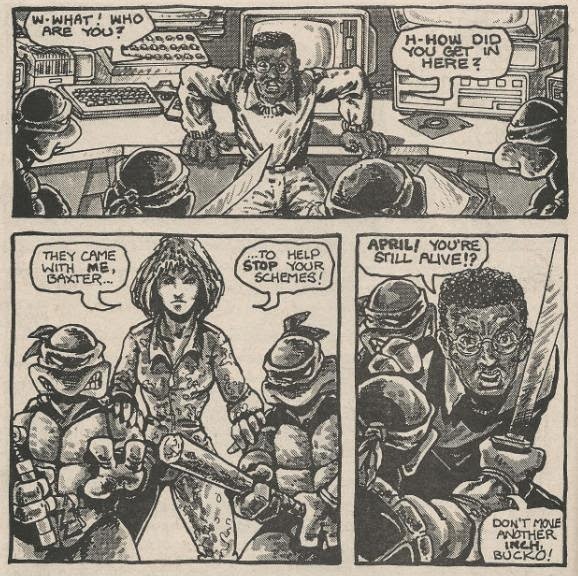 I mean, really, any Turtles media to feature April has had to do this story, to varying degrees of faithfulness. But while the “working for Baxter” thing doesn’t always make the transition, you’d be surprised how many of the essentials do: April running for her life from something, the Turtles saving her, her fainting, freaking out when she wakes up…you know the drill. If you’ve seen any version of the TMNT prior to reading this issue then, well, it can make it sort of boring since you’re probably already intimately familiar with at least half of the plot. Baxter Stockman has very rarely been a good villain. He takes “mad scientist” to a whole new depth of shallowness (what I just typed didn’t even make sense), being incredibly, incredibly boring. One could argue that he’s Eastman and Laird’s commentary on “mainstream” comic book super villains, as Lord knows they never missed an opportunity to rag on DC or Marvel in their editorials and letter columns in these old books, but if that was the case, then, well, they didn’t do a very good job. The entire plot is very “Saturday morning cartoon” and Baxter’s just dull. His eventual return in TMNT Volume 2 will work to make him more interesting, but here he’s just completely forgettable. What TMNT #2 does that TMNT #1 didn’t really get a chance to accomplish is introduce some individual personality traits to the Turtles. Raph’s psycho-ness is starting to become apparent, as is Don’s proficiency with electronics. Mike still hasn’t become a yukster yet, but give him time. And Leo still has no personality, but let’s be fair: Leo has never had any personality. Eastman and Laird’s art seems rougher than it did in the first issue, but I think that has to do with one of their worst setbacks in these early comics: an inability to draw expressive human beings. 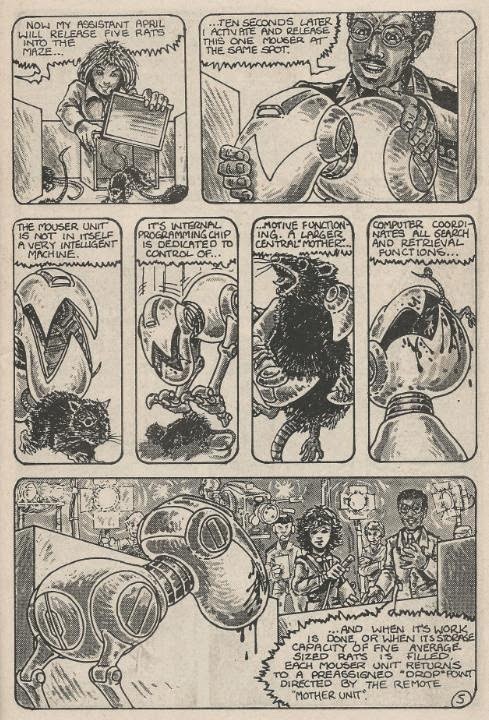 Their Turtles and mousers look great, the gritty sewers look great, the action looks great…but both April and Baxter seem cursed with incredibly boring countenances. April’s “freak out” is especially lackluster; a “dull surprise”, as it were. All in all, it sounds like I’m coming down pretty hard on this issue and I don’t mean to come across that way. The story is iconic and has been adapted into practically every incarnation of the brand, it’s just very…uninspired. Eastman and Laird, at least back in the 80s, prided themselves on their indie status and the fact that they were willing to offer something completely different from the corporate bigwigs at Marvel and DC, often poking fun at the “stale” nature of mainstream comic book storytelling. But TMNT #2 hits all the points of every mainstream comic book cliché I can think of, right down to the damn self-destruct switch. If the entire thing was meant as satire, then I hate to break it to them, but I ain’t laughin’. Well, I somehow liked issue 2. It had some nice action and the mousers seemed far more menacing than their cartoon counterparts. The big fight was fun and thrilling. I also kinda like the idea of undermining big buildings to threat them. And last but not least we finally get some characteristics! I guess the duo was just starting. After the one-shot that wasn't one, they introduced their characters, mixed it with some action and were finally ready to really start. The story itself seems to be secondary.